Today is a rainy day and as much as we both would have liked to spend it relaxed in our PJs, we decided instead to venture out to Kids Fort to spend some energy. We began the morning with a pancake breakfast, a mid-morning snack of half a clementine, and a PB&J sandwich lunch. Then we packed up and hit the play cafe. Something about being at Kids Fort always makes Hunter want to snack. Maybe it’s the snackable, unhealthy options. Or maybe it’s learned behaviour (since I grab a coffee as soon as I walk in, even if I’ve just had one at home). Despite a pretty full lunch, I didn’t want to deny Hunter in case he was genuinely hungry. So I agreed to a package of Ritz crackers and cheese and one yogurt drink. After purchasing the second package, I made it clear that this was the last one and we would not be snacking anymore. Surprisingly, he seemed to believe I would stand my ground. Surprisingly, I did. Realizing I would not give in, he moved on to another adult. “I want a treat, Auntie Erin” he requested. When that was met with laughter, he decided to loiter around the cafe bar giving sweet eyes to the employee. What a relentless little man! 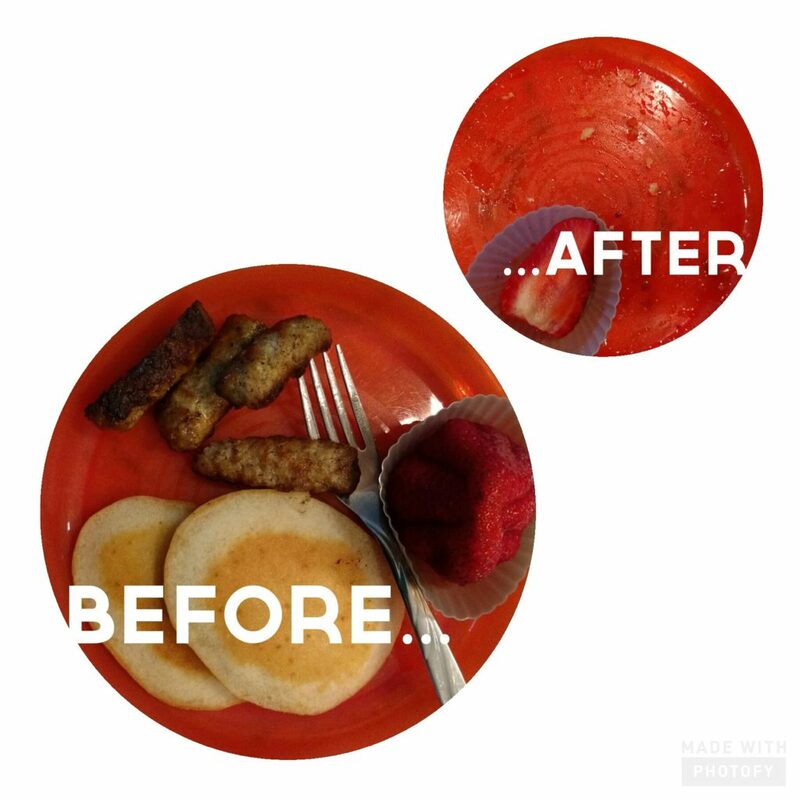 Here is our breakfast before and after. We’ve been sitting at the island together which seems to be working as a reset to our previous mealtime challenges. We can chit chat about our food and focus on eating. So far so good with Toddler Meal Reform.